Well, bless your heart, and welcome to Atlanta. ATL. Y’ALLywood. Home of the Braves, the Falcons, 2 Chainz, and a plethora of transplants. Atlanta’s a cosmopolitan gem that still runs on southern charm; it’s a city filled with trees (yes, seriously. So green. ), historic significance, and great food. It’s fitting to break Atlanta up into neighborhoods, because they are each distinct, and often, distant from each other. When ol’ General Sherman torched the city (#rude), Atlanta struggled with infrastructure, and socioeconomic tensions stagnated any sort of stellar public transportation options. We do have MARTA, Atlanta’s train and bus system, but it’s limited. Check to see if your top spots are right off a line, or otherwise plan on whipping out that Lyft app. Whether you have wheels of your own or you’re using a ride-hailing app, exploring Atlanta is worth the little bit of extra effort. Atlanta’s known as “the city in a forest,” so enjoy the tree-canopied journey along the way. You might even forget you’re in one of the fastest-growing cities in the country. Here are a few helpful hints for navigating this city of neighborhoods. MARTA: ATL’s transit system. The bus and train lines are a bit limited, so be sure to check the route map to see if your top sites are along a line. Frequency ranges from every 10 to 20 minutes depending on time of day, and MARTA’s carriage turns into a pumpkin at 1:00 am. OTP / ITP: Outside the Perimeter/Insider the Perimeter. For you non-southerners, that’s Interstate 285 that circles the city and separates Atlanta-proper from the suburbs. The Beltline: A converted train line that connects several intown Atlanta neighborhoods. It’s an ambitious project that’s still underway, but the Eastside Trail is the most developed with restaurants, gyms, and even breweries right on the path. Walk, run, or bike, and try not to get too distracted by ATL’s cutest four-legged residents along the way. Here’s what you can’t miss if you find yourself in one of Atlanta’s many eclectic neighborhoods. 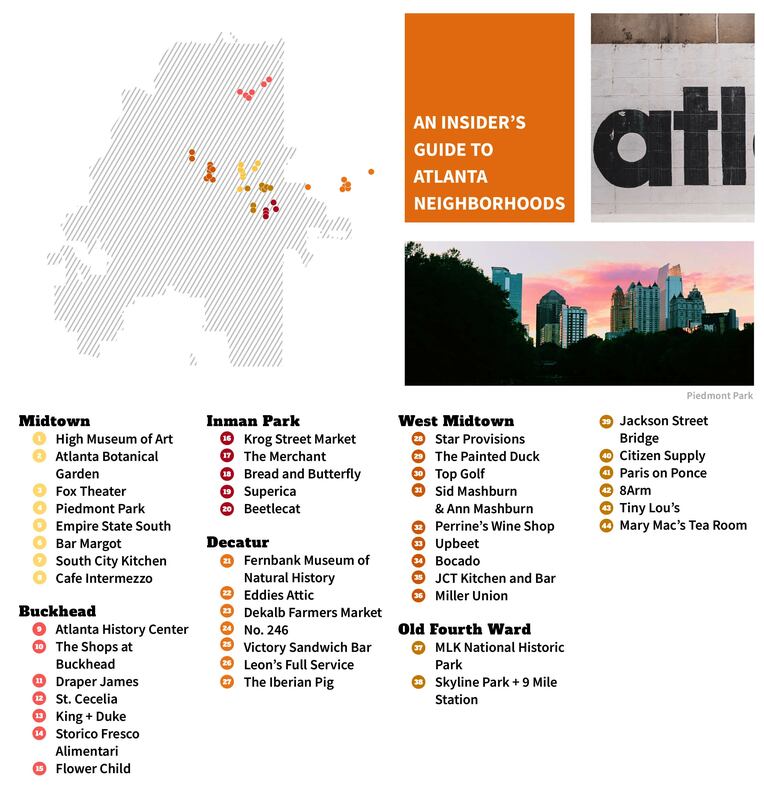 Midtown is buzzing with life, and one of the easier neighborhoods to access through MARTA. It’s home to some of the city’s most vibrant residents, museums, historic homes and, perhaps most notably, our version of Central Park: Piedmont Park. You’ll feel oh-so-cultured after spending an afternoon at The High. The distinctive white facade has been featured in films like “Black Panther” and “The Hunger Games,” but it’s what’s inside that counts. In addition to The High’s prolific permanent collection, the museum rotates through incredible exhibitions each season. Nestled within Atlanta’s largest park is a botanist’s dream. The 30-acre property features a museum, greenhouse, and expansive gardens with nearly every type of flora—it even boasts one of the largest orchid displays in the world. Hitting Atlanta in the winter months? Not to worry; the gardens have an amazing holiday lights display that has quickly become a can’t-miss Atlanta tradition. One of the most special venues to catch a show in the city, the Fox Theatre has displayed its sparkling marquee lights on Peachtree Street since the 1920s. You’ll feel transported into Arabian Nights as you step into the auditorium, which features gilded turrets, stained glass, and a cobalt, starry night sky. Atlanta’s largest greenspace is always bursting with activity. You’ll find residents perfecting their tai chi or HIIT workouts in the meadow, playing a pickup soccer game or swimming at the aquatic center, and even catching a live concert or selecting fresh produce at the weekend farmers market. Chef Hugh Acheson’s refined southern eatery sits in the heart of Midtown. Step inside and you’re sure to be served plenty of southern hospitality and upscale fare. Stop by for coffee and pastries in the morning on your way to Piedmont Park, grab a killer cocktail in the afternoon, or play bocce ball on the patio any time of day. Tucked within the Four Seasons Hotel is the trendy lounge Bar Margot. Swing by for a drink before a fun evening out, or grab a night cap and dessert from their decadent late-night menu. Looking for a contemporary spin on Southern classics? South City Kitchen is your spot. From fried green tomatoes to chicken and waffles, your taste buds won’t be disappointed. This European-inspired coffee house offers a decadent (and seemingly endless) menu of coffees, teas, and sippable chocolate. Grab an outdoor bistro table on the patio, order a piece of cake with your beverage of choice, and you’ll feel as if you’ve found a little slice of Paris in the Peach State. 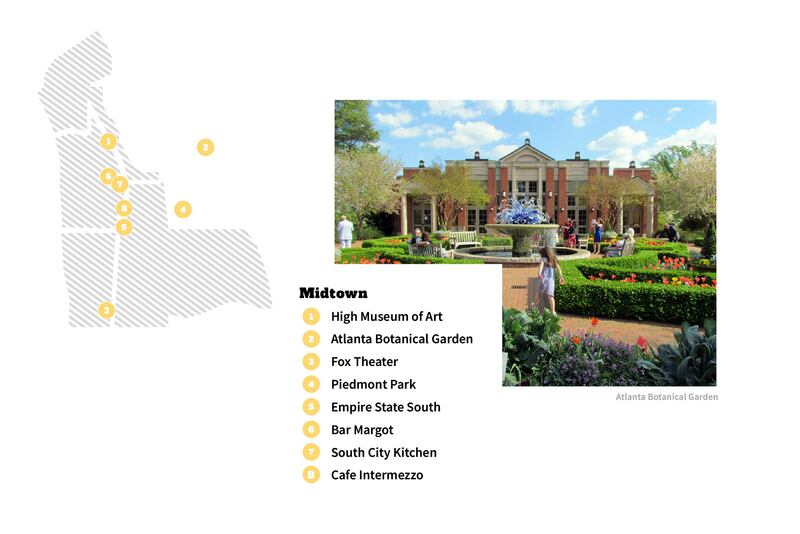 Midtown residents have the best of the city at their doorstep. Housing is a mix of high-rise apartment buildings with modern flair, low-rise historical condos with classic charm, and converted homes that offer split residences. Wander down some of the quiet residential streets of Midtown and you just might find the restored craftsman home of your dreams—but it’ll cost you a pretty penny. Both a business and fashion hub, Buckhead’s skyline attracts young working professionals who want access to work and play without killer commutes. But tucked away just beyond the frantic traffic lights you’ll find quiet streets with impressive houses and gorgeous lawns. 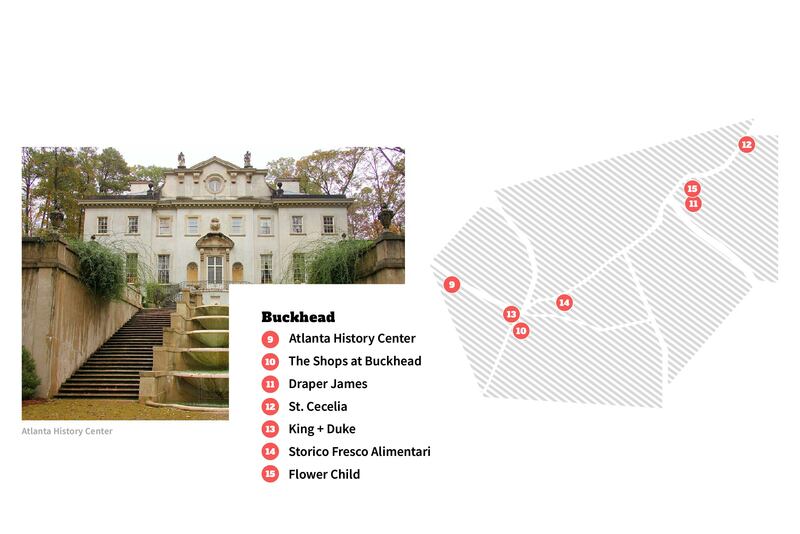 This little pocket of the city is home to some of the highest rated public schools in the area, and with parks aplenty and its central location, Buckhead seems to have it all—for those who can afford it. At the Atlanta History Center, you’ll find exhibits highlighting Atlanta’s cultural significance, stunning gardens, frozen-in-time farmhouses, and—perhaps most impressively—the unforgettable Swan House mansion. Whether you’re window shopping or ready to whip out your credit card, The Shops at Buckhead boast some of the highest names in fashion—and some delicious eats along the way. Peruse Atlanta’s “six city blocks of style,” where you’ll find the likes of Dior, Hermes, and Christian Louboutin. Fan of Reese Witherspoon, are you now? If you can’t say no to gingham, a well-tailored A-line, or a cheeky Dolly Parton tee, Reese’s flagship is for you. You’ll be a southern belle in no time, darlin’. In the mood for something a bit more rustic and hearty than pasta? King + Duke—named after two characters in Mark Twain’s classic “The Adventures of Huckleberry Finn”—features a 24-foot hearth where you’ll find fine cuts of meat and seasonal vegetables roasting over the open fire. The unassuming Storico Fresco Alimentari is a local gem. Hidden on a small side street, this Italian paradise is both a friendly trattoria and an Italian market. Pull up a chair and stay awhile for a romantic dinner (bottles of wine are half-off on Mondays), or walk up to the counter and order a delicious handmade meal that you can cook and serve at home. Either way, it’s a win. If vegan-friendly options and designated yoga mat parking are more your speed, stop by Flower Child for a guilt-free—and yet somehow still absolutely delicious—meal. From avocado toast to hearty salads and grain bowls, your body and soul will be glad you made the trip. Certainly one of the more expensive neighborhoods in the city, Buckhead residents pay a premium for accessibility to hip restaurants and retail. In the buzzing hub of Buckhead, you’ll primarily find high-rise condos and gated townhomes. But turn onto Buckhead’s side streets and you’ll find stunning Southern mansions with unique architectural styles and immaculate landscaping. Inman Park is one of the hippest neighborhoods in Atlanta. Cute (and delicious) restaurants abound in this walkable ’hood right along the Beltline. Many residents have renovated historic homes in the area, and it’s become a choice home base for celebrities filming in Georgia. Eat your way through this lively food hall, where you’ll have authentic Italian pizza, decadent oysters, spicy margaritas, and fiery Spanish tapas at your fingertips. Come hungry and explore a world of flavors, rain or shine. 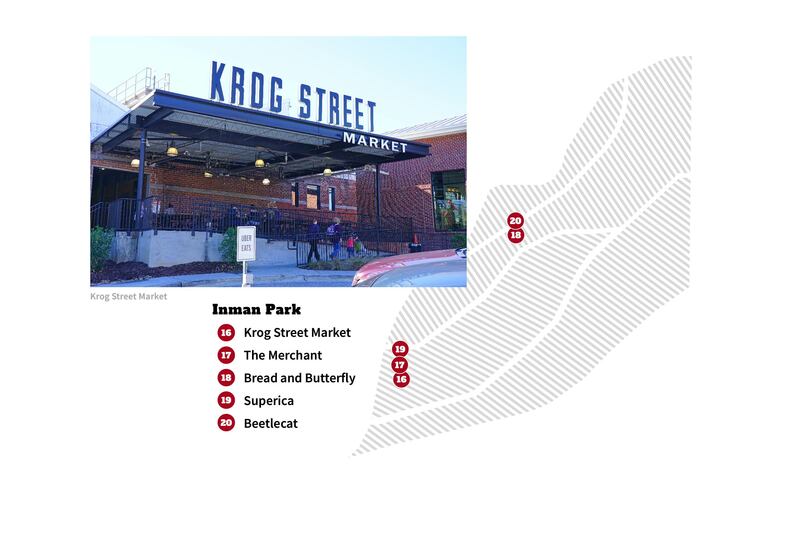 Within Krog Street Market you’ll find The Merchant, a quirky gift shop bursting with sarcastic stationery, colorful cookbooks, and locally sourced home decor. Both sassy and southern, it’s a great spot to pick up a little something for yourself and others. Named after the childhood classic “Alice’s Adventures in Wonderland,” Bread and Butterfly is a Francophile’s dream brunch spot. Sip a cappuccino and order a flaky croissant in the morning, or snag half-priced wines at their French-inspired happy hour on Monday-Saturday from 4 p.m. to 6 p.m. Located within the bustling Krog Street Market, Superica serves up covet-worthy Tex-Mex. Their Krog Street location has live music every Thursday night, and their brunch offering of hot cakes covers a multitude of weekend sins. Think you can’t get great seafood in Atlanta? Think again. The eclectic eatery is situated in the heart of Inman Park and features oysters, shellfish, and tiki style drinks galore. Stop by between 11 p.m. and 2 a.m. for their late night specialities, which include everything from lobster rolls to donut burgers. Residents have the advantage of walking to most of their favorite spots, and easy access paths like the Beltline and Freedom Park trail make walking or biking a breeze. Many of the homes along the streets of Inman Park have been renovated, while other residents opted to raze a dilapidated home and build a modern new construction. You’ll find an abundance of interesting free standing homes, both historic and modern, within Inman Park along with a handful of condos and duplexes. Ah, Decatur. A city within a city. Park along the Decatur Square and give yourself time to explore—you won’t run out of fantastic dining and entertainment options. Situated on the Eastside of Atlanta, Decatur is home to Agnes Scott College and just a stone’s throw from Emory University. It has become a mecca for students and families alike, where cheap eats and dive bars seamlessly mesh with upscale cocktail lounges and steakhouses. A MARTA train stops in the middle of the Square, so it’s a cinch to explore even if you don’t have your own set of wheels. 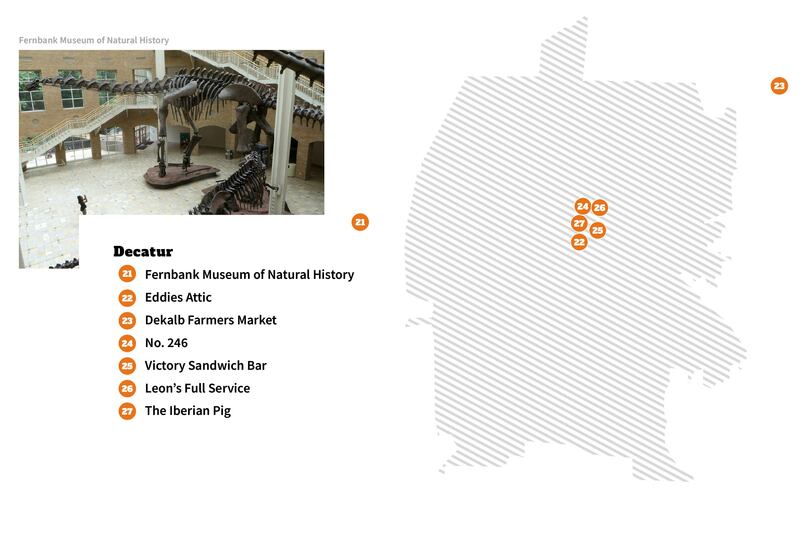 If you’re looking for dinosaur artifacts in Atlanta, look no further than Fernbank. With indoor and outdoor exhibits, families can enjoy wooded trails and 2D and 3D experiences in Fernbank’s Giant Screen Theater. Interested in a unique date night sans kiddos? Fernbank After Dark is a 21+ event hosted the second Friday of each month, where you can get your science on with a boozy drink in hand. The intimate stage tucked away on the top floor of an unseemly brick building may not seem like much, but it’s where artists like John Mayer, Sugarland, and Justin Bieber performed before they were household names. You can catch an up-and-coming singer-songwriter taking the stage just about any night of the week. Who knows—they might be the next big thing. When you walk into the Dekalb Farmers Market, you’ll see 184 flags hanging from the ceiling. The 140,000-square-foot warehouse is truly a world market, where you can find delicacies and specialities from each of the 184 nations that proudly hang their flag at the entrance. Wander the aisles for those hard to find spices, and walk away with flamboyant and unique produce that’s sure to wow your dinner guests. With upscale yet unstuffy Italian fare, No. 246 is hard to beat. The staff has always been exceptionally friendly in my own experience, their seasonal menu is always on point, and the No. 246 meatball is a delicious appetizer that’s sure to kickstart a memorable meal. This former gas station has become a beloved local favorite, and not just because of the bocce courts and lush patio. Known for its great food, drinks, and atmosphere, Leon’s caters to everyone’s fancy, whether you’re vegan, gluten-free, or you like ordering “bacon in a glass.” Yes, it’s on the menu, and yes, it’s delicious. If you’re looking for an unforgettable meal with exotic offerings, you’re sure to have a true culinary experience by dining at The Iberian Pig. Spanish-style tapas rule the menu, with quality ingredients defining every dish. Be sure to make a reservation; this is the place to be. With the convenience of the city and the perks of the suburbs, Decatur attracts those looking for a bit more space and a good school district. Families may opt for townhomes near the Decatur Square or freestanding homes ranging from classic ranch-style residences to historic behemoths. Lovingly dubbed “The Westside,” West Midtown is a revitalized industrial area, full of renovated warehouse spaces and local artisans. You’ll find a variety of coffee shops fueling students of Georgia Tech—the Yellow Jackets call this neighborhood home—and in the coming year, the area will have one of the largest parks in the city as the Westside Reservoir transforms into a 280-acre public greenspace. Tucked away on Ellsworth Industrial Boulevard, there’s an A-frame building with ample natural light. Star Provisions offers breakfast and lunch counter service with a full espresso bar and beer and wine by the glass. It’s both a market and cafe, so you can sip your coffee while leafing through curated cookbooks and ordering quality cuts of meat, seafood, and cheeses. Sure, you’ve been bowling, but have you ever been duckpin bowling? The Painted Duck is equipped with 16 duckpin bowling lanes and elevated menus that won’t remind you of 6th grade birthday parties. If bowling still isn’t your thing, there are plenty of other classic games (think horseshoes, shuffleboard, and knuckleball) that may tickle your fancy. Never swung a golf club in your life? Not to worry: Topgolf makes the gentleman’s game accessible to just about anyone. Players earn points by hitting golf balls into designated targets and servers deliver food and drinks directly to your bay. Now that’s the way to golf. The dynamic duo Sid and Ann Mashburn (yes, they’re married) have become Atlanta’s southern style icons. They’ve blended Italian simplicity with southern charm, resulting in impeccable cuts and timeless accessories. Their respective stores, Sid tailoring to men and Ann to women, are located in the trendy White Provisions district, and it doesn’t hurt that there’s an espresso bar in the store to ensure you can sip and shop all at once. 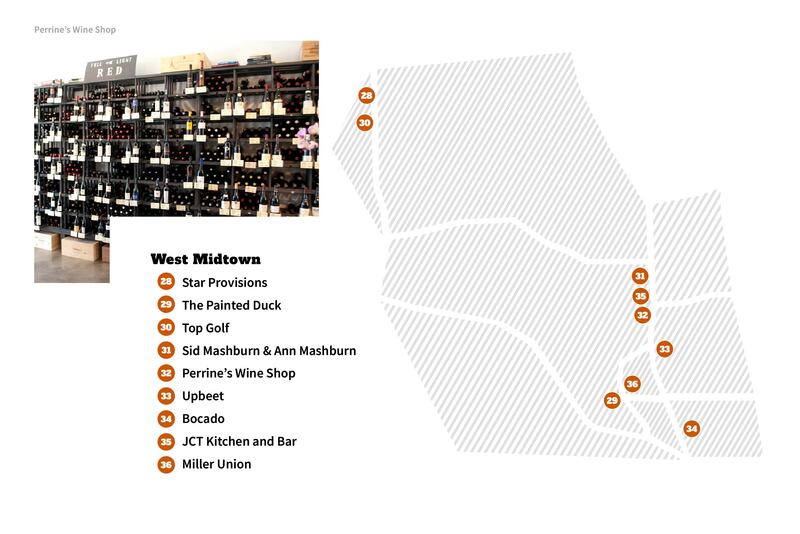 This small wine shop located in the White Provisions District packs a punch. The eponymous shop’s owner, Perrine Prieur, is an accomplished sommelier from Burgundy, France. Armed with an oversized farm table, Perrine often hosts wine tastings in the space. Attending a tasting is a great way to gain exposure to new favorites—and you might just meet some new friends along the way. Green smoothies. Grain bowls. Avocado toast. Detox salads. It almost feels like a crime to show up at Upbeet in anything but yoga attire. The breezy space channels SoCal vibes, and with options to build and customize each dish, you’re guaranteed to walk away happy. Bocado makes up for its industrial atmosphere with comforting American cuisine and killer cocktails. While everything on the menu is exceptional, the establishment is perhaps best known for their burger. Do yourself a favor and order it Westside style with herb fries, and resist the urge to order it every night for the rest of the week. This is the coveted summer patio, people. Along with great southern staples and a rotating drink menu, the JCT. patio has skyline views and live music three nights a week. If you’re into farm-to-table goodness, Steven Satterfield’s Miller Union is right up your alley. Satterfield won the James Beard Award for Best Chef: Southeast in 2017, so you’re sure to love anything on his irresistible menu of New American classics. Given its proximity to Georgia Tech, much of West Midtown is composed of condos and apartment buildings, with freestanding homes and duplexes away from the neighborhood center. The outskirts of West Midtown have become an up-and-coming location in the city, attracting those who dream of homeownership inside the Perimeter. The Old Fourth Ward neighborhood (sometimes abbreviated to OFW) is full of history, old and new. You'll find both Martin Luther King Jr.’s boyhood home as well as Ponce City Market, a converted Sears building that takes up a full city block. Attracting residents and tourists alike, PCM is a thriving food hall and shopping destination. Also, Old Fourth Ward’s convenient location just off the Beltline makes it an effortless place to explore by foot or bike. The South is steeped in history, and Atlanta holds its fair share. Perhaps most famously Atlanta served as the birthplace and launching grounds of the Reverend Martin Luther King Jr. You can visit his childhood home, the church he once pastored, Ebenezer Baptist, and his final resting place next to his wife, Coretta Scott King. Take a freight elevator to the rooftop of Ponce City Market and you’ll find yourself at Skyline Park. Stocked with carnival games, putt putt golf, and panoramic city views, it’s a great place to feel like a kid again—all while catching a spectacular sunset. For more adult fun, pop into the adjacent 9 Mile Station, Ponce City Market’s rooftop beer garden. If dusk is approaching, you’ll be sure to see spectators setting up their tripods and snapping selfies on Jackson Street Bridge. Overlooking Freedom Parkway, Jackson Street Bridge offers one of the best views of Atlanta as the sunset slips behind the skyline. Citizen Supply sits on the second story of Ponce City Market and displays the craft goods of local artists. The store even serves as a workspace for artists-in-residence, so you can often find leathermen refining their wares right before your eyes. The space regularly hosts workshops, and they even have a rentable photo studio space. Looking for a unique shopping experience? Paris on Ponce is part Moulin Rouge, part vintage thrift store, and all sorts of funky. You could spend hours in this 46,000-square-foot treasure trove—Heck, you can even get your haircut at the barber shop inside. If you’re walking there from the Beltline, look for the miniature replica of the Eiffel Tower and you’ll know you’re in the right place. 8ARM is a trendy cafe nestled in a mural-covered industrial building just down the street from Ponce City Market. Offering just eight menu items for brunch and dinner, the choices may be limited, but you can be sure they’re curated to perfection. Mary Mac’s has been serving Atlanta residents their meat-and-three since 1945. The establishment has become synonymous with classic Southern cooking, and you’re sure to get a generous helping of bless-your-heart hospitality if you make the trip. Walkable and trendy, Old Fourth Ward is where all the wild things live. Residents love that they can leave their cars parked for the weekend and access their favorite brunch spots by foot, bike, or scooter. (You can find shared electric scooters waiting patiently on the sidewalk just about anywhere in OFW.) Most residents opt for modern condominiums and apartments, though some brave souls are renovating and revitalizing the freestanding, historic homes that still remain in the area.